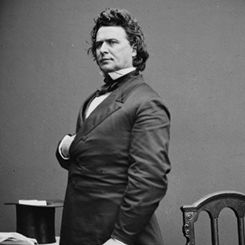 Image courtesy of the Library of Congress A five-term Member of the House of Representatives, James Ashley of Ohio chaired the Committee on Territories from the 37th through the 40th Congresses. On this date, the House Committee on the Judiciary, by a vote of 5 to 4, refused to send articles of impeachment against President Andrew Johnson to the full House. Radical Republicans in the 40th Congress (1867–1869) were pitted in a power struggle with President Johnson over the shape of Reconstruction policy in the South. The Radicals, who viewed Johnson as too lenient toward the former Confederate states and as a threat to their legislative agenda, sought avenues to remove him from office. In January 1867, Representative James M. Ashley of Ohio had introduced a resolution, adopted by the House, instructing the Judiciary Committee to “inquire into the official conduct of Andrew Johnson.” After interviewing witness and collecting evidence, the committee voted against impeachment proceedings in June, but the issue did not die. Eventually, on November 25, 1867, it recommended impeachment proceedings in another 5 to 4 vote; but the full House rejected that report. Johnson, however, was bent on confronting Congress. In February 1868, when the President dismissed Secretary of War Edwin Stanton—in violation of the Tenure of Office Act—congressional retribution was swift. The House voted 126 to 47 to impeach President Johnson, but the Senate later acquitted him by a slender margin.